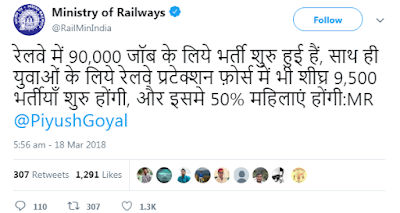 Indian Railway Recruitment 2018 For 9500 RPF (Railway Protection Force) Post. Indian Railway Has Published the Recruitment Notification for Railway Protection Force Posts. Eligible Interested Candidates Can Apply Via Online Mode. Notification Will Publish Soon. Indian Railway Recruitment 2018 For Railway Protection Force Post. No of Vacancy- 9500 Posts. Interested Candidates Can Apply Through Official Website. After filling Online Application Candidates Need to Send the print out of application on or before: Dates Will Publish Soon. Notification Dates Will Publish Soon.